The backpack weighed 14 kilos, the last I had checked it. It seemed just right. I was carrying just 7 sets of clothes for 21 Days and was travelling light. I unhooked the water pouch from the day bag and inserted it into the backpack. Tightening all the side straps and the ones on the front, I lifted it again to ensure I had the right bag balance. The day bag I handed over to Lakhpa who roped it together with the others. His load would easily total 40 kilos. 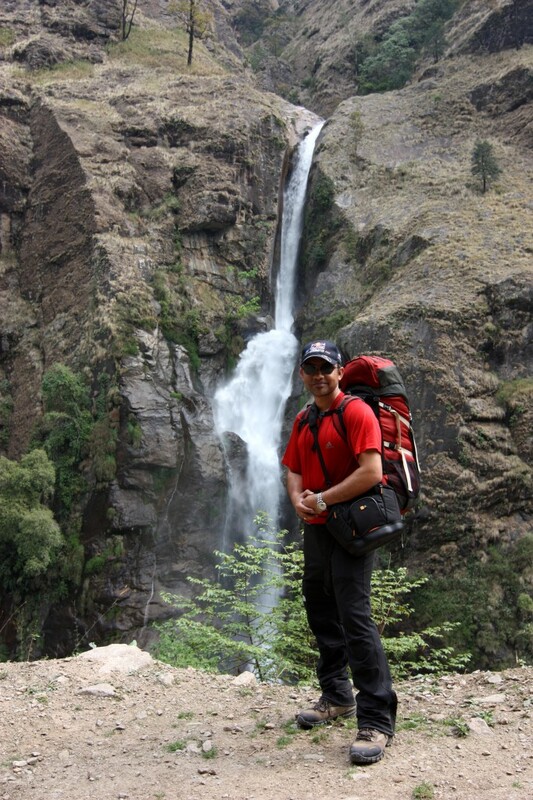 I was keen on climbing with the 14 kilos all the way. My first target was reaching 10000 feet. I was at 1100 mtrs/ 3608 ft. Small challenges make it worthwhile in the mountains. They keep you focussed and determined and also act as daily goals which you set yourself. You work towards achieving them. Session by session. Day after day. Until you inch closer to the end goal. A lot like 5 day cricket. Some of the classic run chases are similar. India v Australia in 2000 was one such when India had a big score to overhaul and then set a target for the rampaging Aussies. Rahul Dravid and V.V.S Laxman out-batted the Australians in the second innings, reached their individual landmarks and set the opposition a target they had to chase. India went on to win the match eventually. We had just finished breakfast. Apple porridge, double omelette and a glass of hot lemon to wash it down. The lodges at Syange were buzzing with activity. Various teams were readying for departures. We had a couple from Belgium and two boys from Israel in the dining hall besides the sherpa guides, porters and the hotel staff. All teams (including us) kept to themselves, obviously focused on the day ahead. The Israelis had kept us company from Besishaher, travelling on the roof of the bus, apparently ticketless. How they had managed, considering the drive, I don’t know. They were carrying their own stove and utensils. A bit surprising as well. They either intended to live the life of bushmen having no contact with the small comforts provided by the lodges or were intent on running a tight ship with minimal expenses. I found it difficult to slot them. I was sure I would find out more on the trail. It was 7.45am. We were 15 mins behind the ETD. KB asked us to start walking. Lakhpa had already left. He would need the head start. The load would slow him down as the inclines commenced. Varun took the lead, followed by KB and I brought up the rear. I was busy capturing scenic frames. With the backpack snug on the shoulders, the camera bag slung diagonally across, I was a SLR wielding traveller with itchy fingers. Our halt for the day would be Tal (1700 mtrs/ 5576 ft). We would decide on having lunch as we progressed on the trail. It depended on how quick or slow we climbed. The road to Tal was picturesque and easy. We were still very much within tree lines. Range after mountain range continued one after another as far as the eye could penetrate the morning haze. The sun tried to break through the haze and the sheet of broken clouds. Sometimes a single ray, sometimes multiple rays, highlighting a mountain patch, a highlander settlement or two. Wisps of smoke were visible from these habitations indicating a flurry of human activity within. 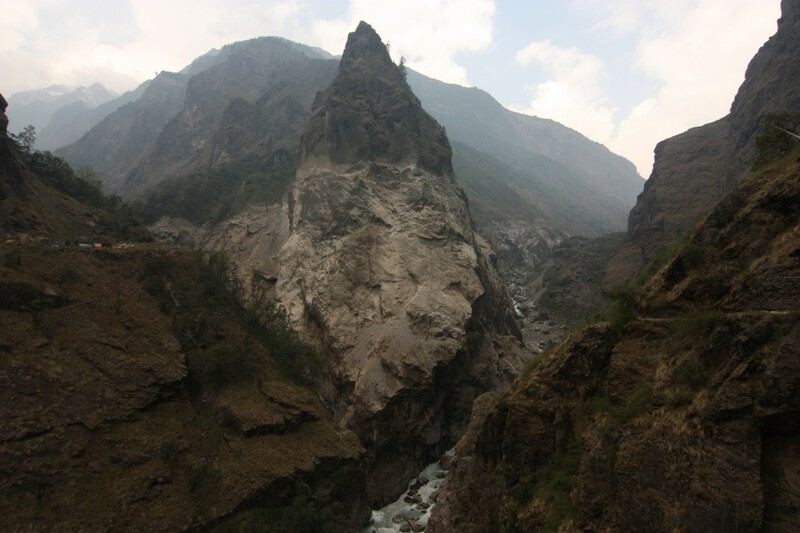 Between the rock faces on either side, was the raging white Marsyangdi, gurgling, snapping, hissing furiously as it broke over massive boulders in its way. She kept us company all the way till Tal. The trail itself was a long and a winding one, with a healthy mix of inclines for good measure. At times it led us on the left of the raging white and at times on the right. 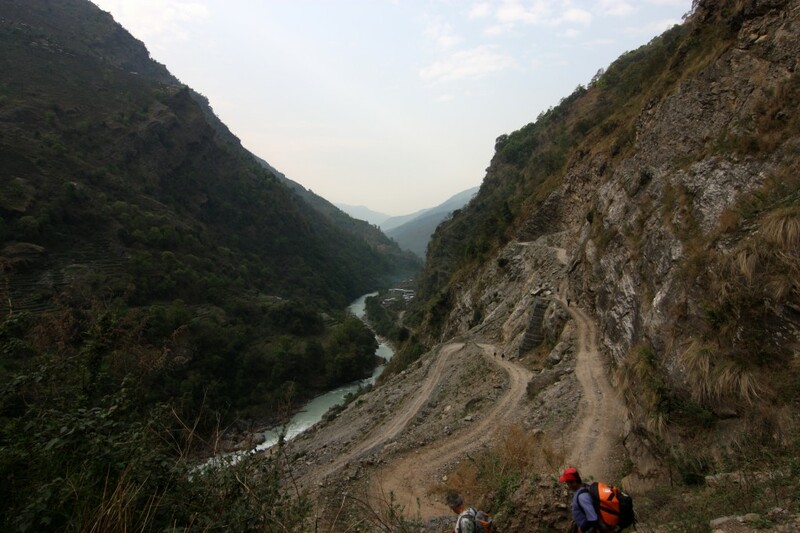 We crossed multiple iron bridges, each about 100 steps in length, dangling, swaying and bouncing over many a yawning valley and the furious Marsyangdi. The knees took the brunt when crossing these. The force of the wind was also tremendous when you reached its centre. Removing the lens cap to fire away a few pictures, as you remained stationary on the bridge was fraught with the risk of losing parts of the camera equipment. One could feel the wind chill too. The bridges could accommodate two way traffic, but everyone preferred a single line while crossing them. Those who wanted to cross from the other end, waited patiently. 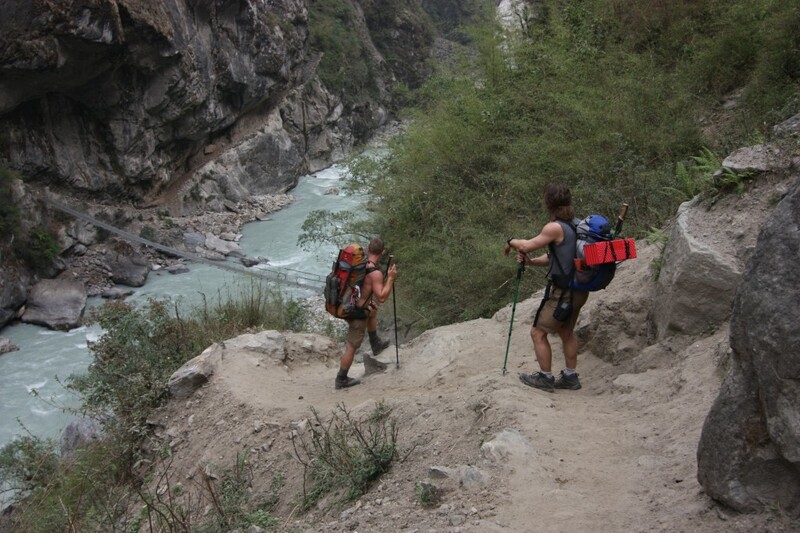 The first day of any climb is always the most energetic and maybe just a bit strenuous. The body breaks into the journey. Call it the testing phase. It always is. The breathing pattern and rhythm, the flexibility of the legs, the thighs and hamstrings, the shoulders all have to function in unison to deliver a satisfactory result. And yet you are always aware that you also want to push yourself a bit and stretch the mind, the lungs, the muscles and limbs. Flexibility is equally important in all departments. 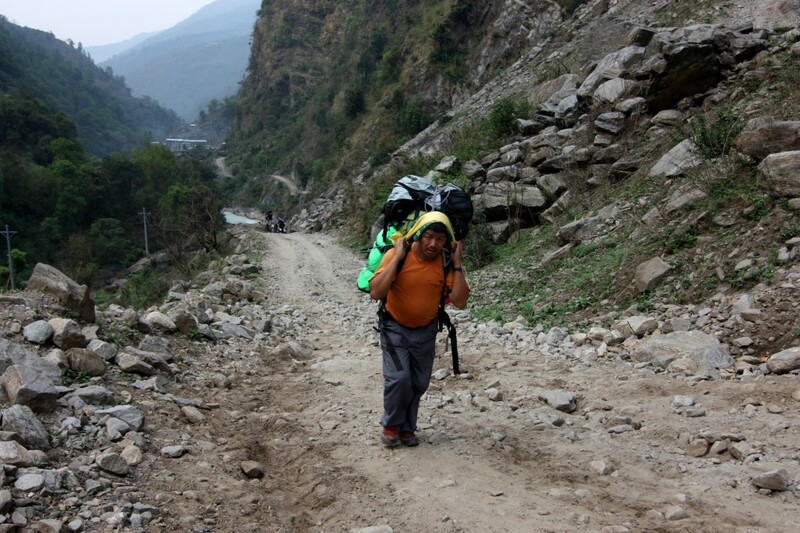 A little over two hours into the walk, we reached Jagat (1300 mtrs/ 4264 ft). We stopped here for a bit and refreshed ourselves with chai and hot lemon. It was a welcome breather for Lakhpa. We were drenched in sweat. The sun was shining bright and strong now. The shade of the lodge hence was welcome. 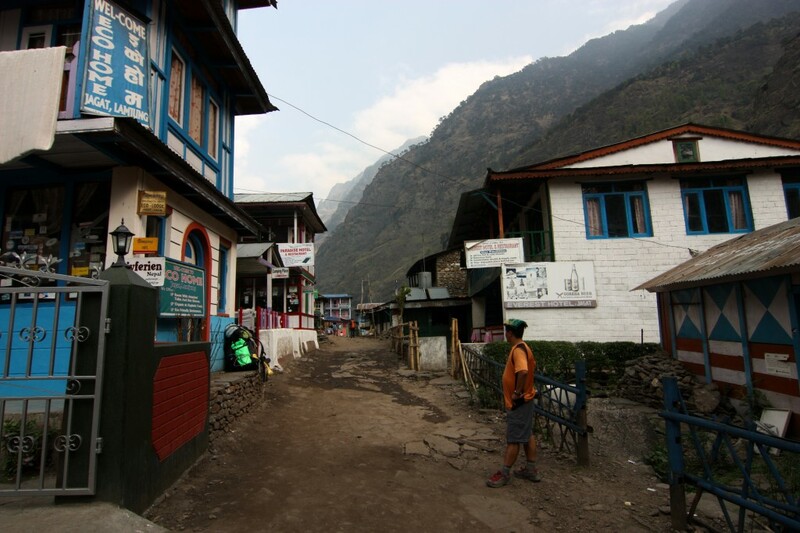 Jagat was very typical of any modern mountain settlement. Mud walled houses mixed with cement ones; small restaurants and a few lodges for weary travellers lined the narrow lanes on either side. The locals went about their morning chores the way they would every day. The sight of us walking into their lanes was not new for them. They would have seen many like us. We brought in business however. A night’s halt with meals thrown in was good money for them. KB hinted at us stopping for lunch at the lodge. We politely declined it, citing not wanting to break the momentum we had gained since we had started. More importantly we didn’t want the body to cool down. Besides, it was just 10.20 in the morning, wasn’t it? It was way too early. Varun and I exchanged quizzical looks over the suggestion. Before we headed out again, I decided to call home to check on wife and son. The damn NCell network that was so highly recommended was blank with zero signal bars. Only Nepal Telecom was alive. The proprietor’s wife dialled Bombay on her handheld. It would cost me 40 Nepali per minute. It was good to hear them. A brief conversation with the wife sufficed. The son was too busy playing with his friends to speak to his father, besides throwing in a passing hello. We thanked the family for their hospitality, paid them for the services rendered and quickly made our way back on the trail again. 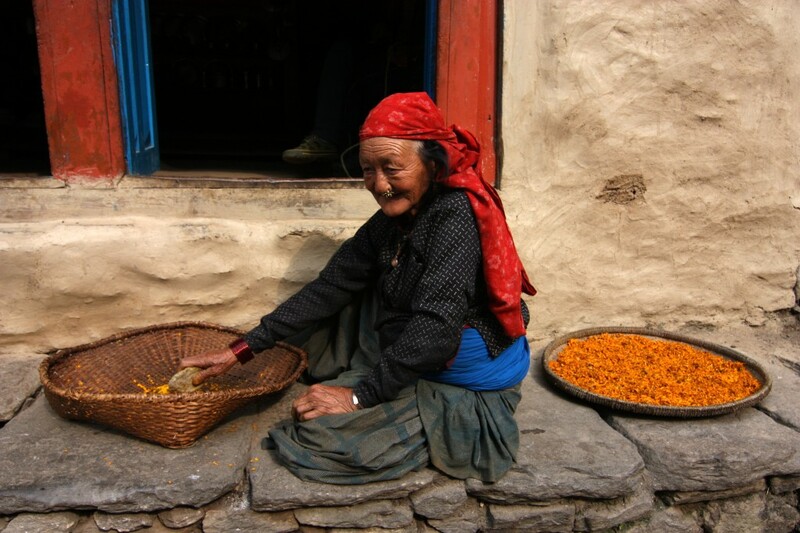 As we walked past the last few of Jagat’s houses we chanced upon an elderly lady, sitting quietly, grinding away something which was bright orange in colour. On closer inspection I saw they were turmeric sticks. The orange glow which radiated, coupled with the light brown shaded mud walls, her bright red scarf, her weathered face with lines etched on them and her dangling nose ring made for a pretty picture. Both of us captured this moment on camera. It was special. The steep inclines continued post Jagat. We kept at them. Building our own individual walking and breathing rhythms by now. Varun had the style of a long distance athlete. Moderate to slow pace with very few to no breaks in between. This was in tune with his training in school. For him it was pure long distance endurance. My style was a bit different. I added the extra zing to the mix. Speed. I have always walked fast. Whether on inclines or flat ground. Agreed, over inclines it meant short to medium bursts with more breaks in between. Over flat ground however there were hardly any. I have always enjoyed the blistering pace and did so even now. Especially once the inclines were behind us. It also meant I was way ahead of KB and Varun. Very soon I had reached another incline. This seemed to be a rocky hill and had a circuitous path all over it. From the bottom, I squinted hard and saw what seemed like a small hut, midway to the top. “Aah, a place to rest and regain my breath. Maybe I’d get some hot lemon too. Let’s get on with it now, shall we Mr. Sen”. With thoughts of sipping hot lemon, I trudged up the rocky face. A teenaged Korean couple kept me company. Well they seem teenaged. They always look young, the people from the orient. By the time I reached the chai shop, it was windy and overcast. Comparatively, the body was hot and sweating. This was the best time to catch a cold. Out snapped the hood of the North Face wind stopper and I covered my head. I could feel the cold on my back. This was the worst part of the mountains. The heat and the cold attacking the body together. And now the wind had also picked up speed. I didn’t stop long therefore, and kept moving. 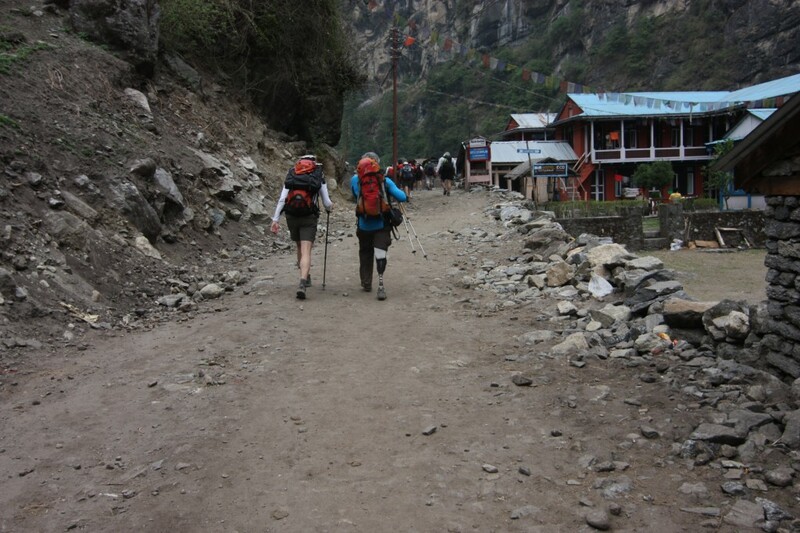 A minor trudge up ahead and I stood facing the faded gate of the district of Manang! And beyond that, far into the horizon I saw silver soil, water, sandbanks, and a lake body. This was Tal. Magnificent on first sight. It reminded me so much of Nubra, in Ladakh. But there were no Bactrian camels. I walked along the sandbanks, taking in the breeze and a bit of sunshine which had seeped through the cloud cover. Father and Son soon appeared around a bend. That’s what the lodge said. I waited outside. Were we halting here for the day or for lunch? It was only 12.45pm. 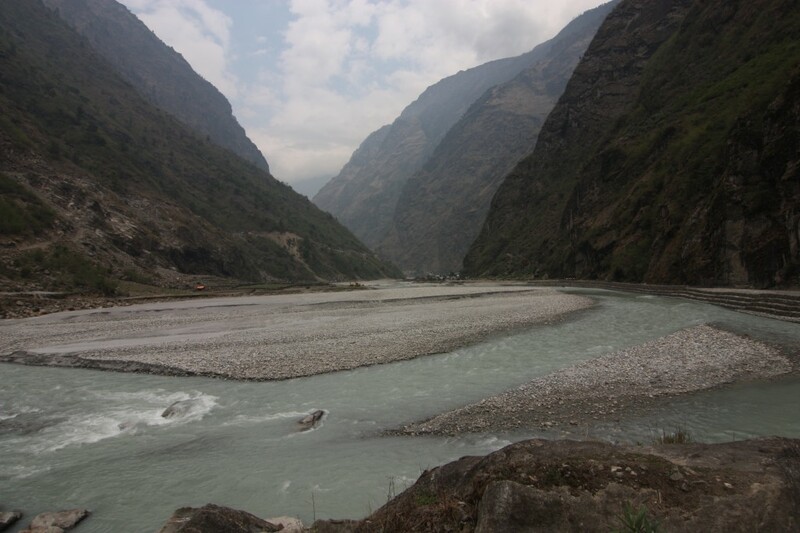 We had covered the stretch from Jagat to Tal in 2.5 hours. I looked back trying to locate Varun and KB and soon saw them walking towards the lodge. We were famished. Varun opted for Dal Bhaat and I preferred Italian fare. Tuna Macaroni it was. By 2pm we had finished lunch. The body had cooled down. It also ached considerably. Especially the legs and the lower back. Discussions over lunch centred around the way ahead. We decided against staying at Tal. We still had daylight. We could reach the next point before nightfall. We agreed Dharapani (1995 mtrs/ 6544 ft) was where we should be. KB was informed as he was busy selecting the rooms for the halt at Father and Son. He had no choice as we wanted to keep moving. The map indicated the distance would take us 3.5 hours to cover. The inclines kept continuing even after Tal. Walking post lunch was strenuous. The body had to settle down to a rhythm once again. But the energy it released was super. The batteries really felt charged. 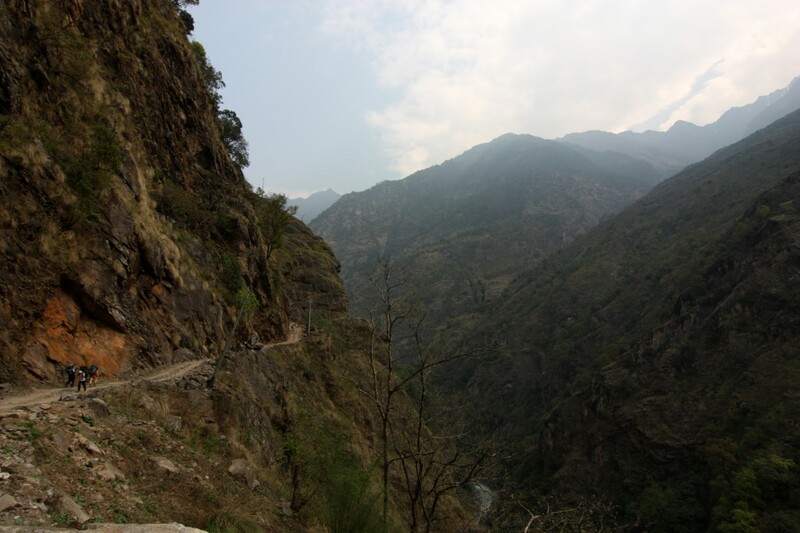 The steep ascents and descents continued all the way to Dharapani. Before reaching there however, we witnessed a strange weathered rock formation. A giant Menhir! “Hey Channa. Check this out. Seems like Obelix has been here”. We stood and gazed at it. It was the most strikingly different weathered rock face I had ever seen. Almost as if someone had this design in mind and had consciously carved it out. Maybe god had. And perhaps he was one of us staying somewhere close. We continued walking for almost an hour and half more and soon started encountering local oncoming traffic. Along with us there were the Brits, the Hungarians, the Israelis and others. Including 2 tough Hungarians and a member from the Brit team with a prosthetic lower limb. Dharapani it seemed was round the corner. And it indeed was. 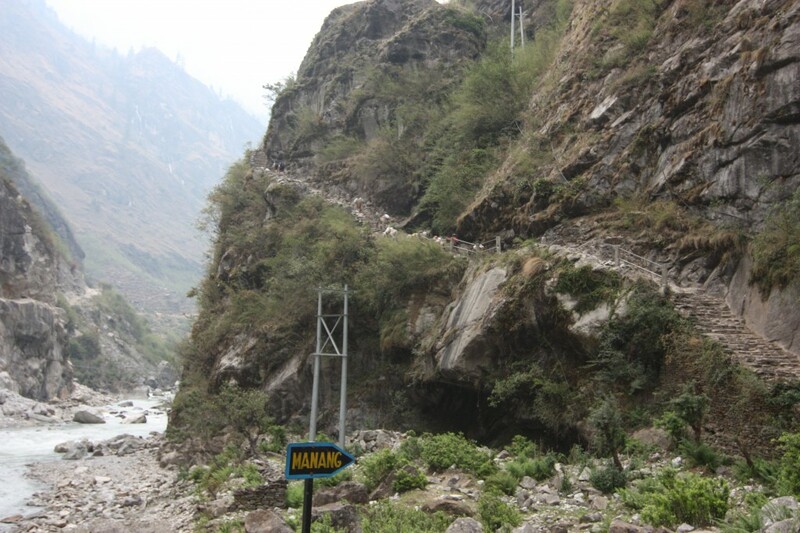 The approach to Dharapani however was split into two paths. The old and the new. One could take either. But it did cause some confusion in the ranks of our fellow travellers. Another 20 mins and I had reached New Tibet Guest House. The lodge halt for the night. It was 5.30 pm by the watch. We had taken 3.5 hours to reach Dharapani. And had walked 8.5 hours the first day. This was just the start we had wanted and had hoped for. I wasn’t looking forward to waking up the next morning. The body aches would be tremendous. A combiflam with the deep heat spray would hopefully help me. Dinner and a very deep sleep. That’s all I needed. This entry was posted in Events, Latest Journey and tagged Annapurna, Australia, Belgium, British, Cricket, Dharapani, Hungary, India, Israel, Jagat, Ladakh, Menhir, Mountain, Nubra, Obelix, Syange. Bookmark the permalink.